I don't eat popcorn and I don't generally advocate eating it because your stomach has a hard time digesting the kernels, not to mention that a naturally low-on-the-bad-food scale is generally eaten in a way that makes it horrible for people....but I've gotta make an exception here. This site is awesome when it comes to things you can do to liven up your popcorn. The first one I opened was Popcorn S'mores, and from there, I knew I'd have to blog about the site so others could discover the fun variations. When I first clicked the link that took me there, I assumed it'd be a site of all the things you could add to a bag of popcorn (you know, add cheese powder or this season or that), but it wasn't. There are actual recipes to use the popcorn, too. 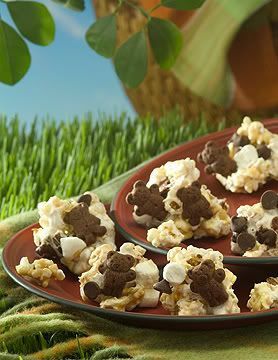 The picture above is of the popcorn s'mores...don't they look yummy? And they can't be any worse for you than the original s'mores combo, so it sounds like a great excuse to me to play around with popcorn, teddy grahams, chocolate chips, and marshmallows, and less messy. A really good recipe to do with the kids. They'll love it! It's the Teddy Grahams that sell those s'mores. I've never cooked with popcorn. I am a fan of the stuff, however. Thanks for the link, Jessi!